Life recently has been some distance from easy, and blog writing has taken a back seat. When the going is tough, the disciplines of praying and reading the bible can easily fall by the wayside – and I’ve had a really good excuse. Then one day, the light came on, and I realised something really, really obvious. It suddenly occurred to me that reading the bible and praying are not recommended in order to keep God happy. I’m not letting him down when I fail to do ‘enough’. Christians are encouraged to do these things because WE NEED THEM! God has put them into our lives to HELP us, not to be a burden we have to fit into our busy schedule. It’s just for me. If I neglect my ‘spiritual food’, God will be just fine – he can really manage without listening to all my woes. His word is there in the bible for me to take enrichment and encouragement from – or not – if I so choose. He’s none the poorer if I don’t bother. The loss is all mine. So without ‘having to’ I’ve been drawn to God’s word in a fresh way. 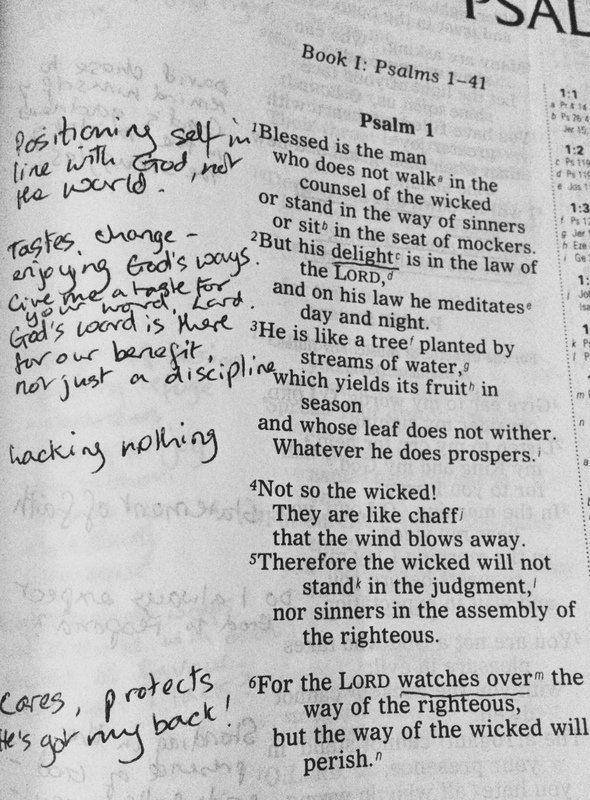 Simply reading a Psalm each morning, and seeing what God is showing me through it. And of course, jotting a few simple thoughts in the wide margin of my bible. I don’t have time to write a blog about it, but I had an idea. Simply to photograph the reading and my jottings, and put them out here. If you can read them – and find some encouragement from them, then I heard right. If not, just pass on. But if you do have any inspiration yourself from these Psalms, I’d really love to hear your thoughts. It would be lovely to share fellowship with you! This entry was posted in Bible, Christianity, Psalms and tagged bible reading, prayer, Psalm 1. Bookmark the permalink. These hard times will pass with no judgement by those who do not shoulder your burden or by those who believe themselves to be right! Like Catherine says the hard-times will pass, and God will continue to pour out His blessings you, even if you don’t manage to do bible studies. I am sure that you are not losing sight of God, just a different approach than you’ve been used to. When the hard-times are over you will be back to your bible study and blogging with a new enjoyment from a totally different perspective and I look forward to what God puts on your heart. I pray for a continual refreshing of both body and spirit as you continue this part of your walk with God.